Does he just goof around or can he play any little songs? I'd love to hear him play. Hey little dude, when you play some sweet blues you can join my hubby's band unless you like rock & roll that's good too! The key to being a great musician is practice, practice, and more practice! That is so cool. Very nice. Thanks for hosting and have a great week. 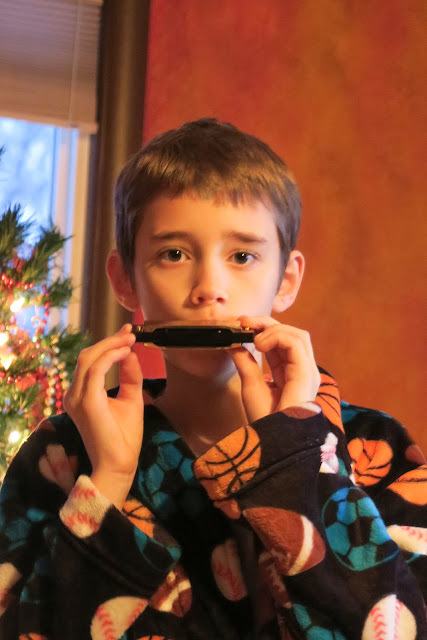 Harmonicas are so much fun, my daughter loves hers too! Glad he seems to be getting use out of his Christmas gift! Monica! Sounds sweet :). I have been wanting to learn how to play it but haven’t got the chance! It’s cool!